If so, I want one. Oh wait, I already have a moustache. Damn. I somewhat miss my moustache. I said byebye for them AD 2005. It's been almost two years without moustache. What can I tell about that time? Eating hamburgers with mayonnayse is easier and tidier, same applies to soups and icecream. But still I miss that furry tickling sensation on my upper lip. When I shaved them off my upper lip was ultrasensitive also. It was best thing that occured because shaving of moustaches. Sidebeard I don't miss that much. Thinking my moustache make me feel renessaince feelings. Maybe I let my hair grow long again and grow some ÃƒÂ»ber cool moustaches. Mmmmmoustaches. 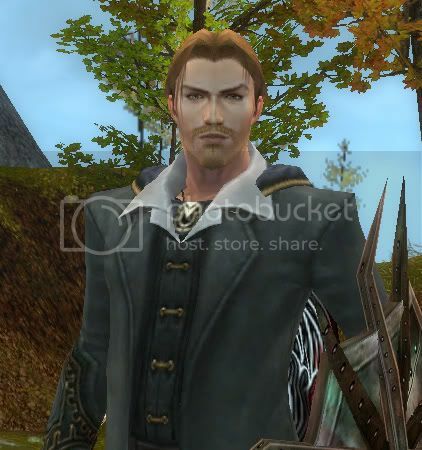 made a new Character in GW...and for some reason he reminds me of someone....but i cannot quite put my finger on it.